WoW! 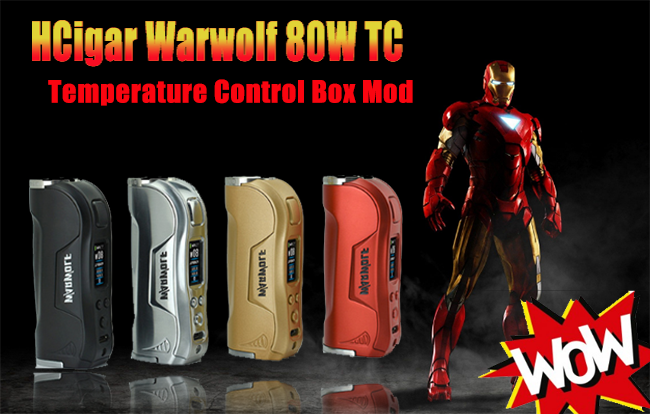 Iron Man~~HCigar Warwolf 80W Mod Defend You! Check check check! Important issue we should say three times, do you think it is a iron man style mod, please check this amazing item! HCigar Warwolf 80W Powered by signal 18650 battery with a maximum output of 80W. Also features an updated HD user interface and the huge fire button, muliple protections and an easily-iunstalled battery cover,with simple and elegant appearance. What's more, Warwolf 80W mod's simple and elegant appearance, the special process of the surface, strong anti-waer, makes it has a superior asethetic value and also cinvenient to carry out. It is sold for $52.99 on efun.top!